Audible signals help blind navigate city. Does Madison have enough? 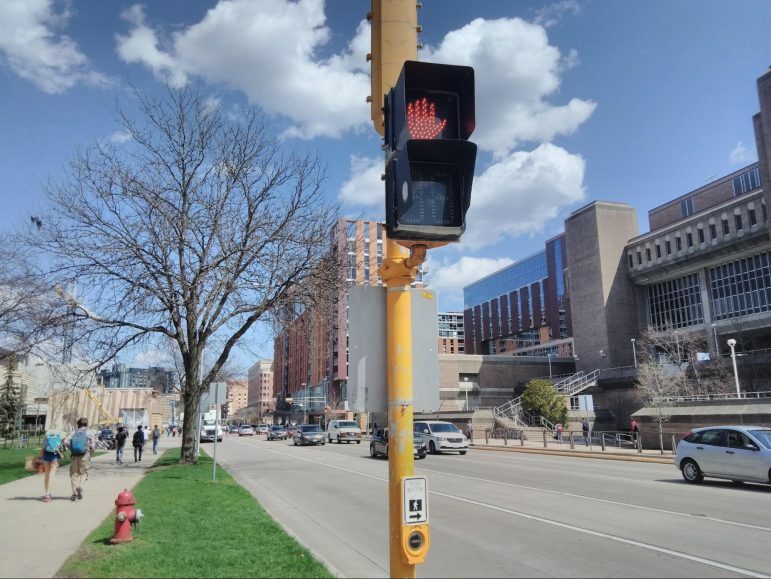 Audible signals such as this one at the corner of Park Street and University Avenue in Madison help visually impaired pedestrians cross streets more safely. Denise Jess wakes up every morning with one thing in mind — what route to take to work? Jess, 55, is a pedestrian commuter and lives in the neighborhood around her workplace. 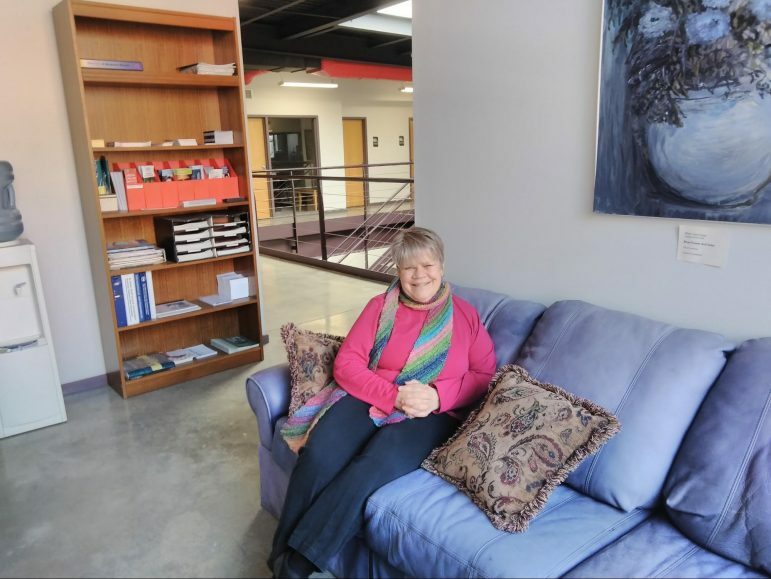 She is the CEO and executive director of the Wisconsin Council of the Blind and Visually Impaired. She takes neighborhood streets as far as she possibly can because they are quieter and there is less traffic. She does, however, eventually have to cross Williamson Street, a major street on Madison’s East Side. Every morning, when she prepares for work, Jess decides whether to cross at South Livingston, Jenifer or South Paterson streets. She said her choice could mean the difference between life and death. Jess is legally blind. She has been visually impaired her whole life — caused by an underdeveloped optic nerve. She has no vision in her left eye and 20/400 in her right eye. Her daily route is determined by the fact that the intersection closest to her office is the most direct but also the least safe because it has no audible controls, which alert blind pedestrians when it is safe to cross. Jess said that statewide, there about 100,000 visually impaired people. A number of older people and Baby Boomers who are experiencing vision loss through diabetes, macular degeneration, retinopathy or other eye diseases do not necessarily identify as visually impaired, meaning the number likely understates the problem. “You know folks will say ‘I don’t see as well as I used to,’ they don’t consider themselves visually impaired even though technically from a legal and a clinical standpoint they are,” Jess said. Denise Jess, executive director of the Wisconsin Council on the Blind and Visually Impaired, says she faces a choice each morning when walking to work. She can go by way of the one intersection that has an accessible pedestrian signal, which has audible directions on when to cross, or two other intersections, which have no audible signals but which are five minutes’ walk shorter. Currently, 73 of Madison’s 386 signalized intersections have accessible pedestrian signals. 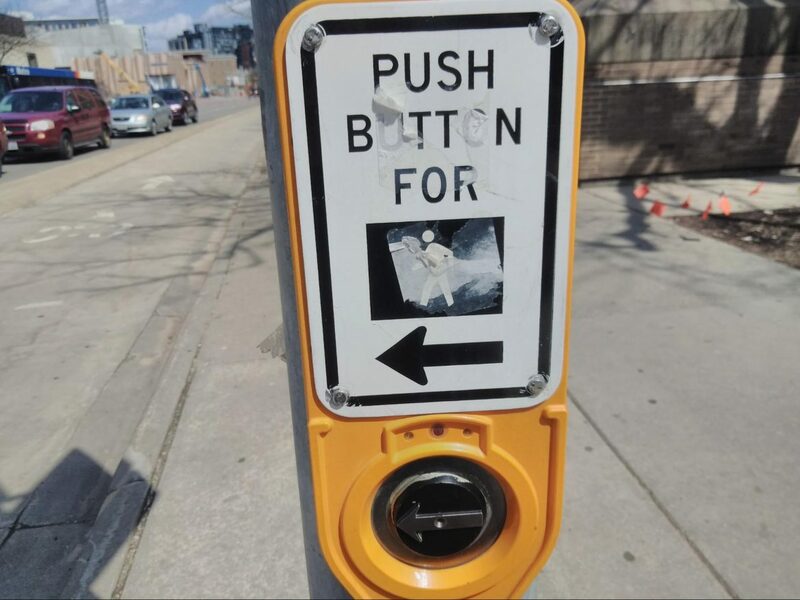 According to the city’s Traffic Engineering department, the cost, not including labor and engineering, is $1,230 for two buttons, enough for one crossing. These signals typically take two to three months from the time an individual makes a request to the day it is turned on. There are three requirements for the installation of accessible pedestrian signals on a crossing. First the intersection must already be signalized. Second there must be a need for an audible signal, which is demonstrated by the request. And finally, the location should have unique characteristics, such as an unusual intersection configuration. Jess said she generally goes out of her way to go to one of the two intersections with traffic signals, walking a block west or east and doubling back a block. When she goes to the intersection near her office with no traffic signal, Jess said she must listen extra closely to traffic before crossing. And there are other things to consider. According to city traffic engineer Jerry Schippa, in recent years, the city of Madison has been purchasing new models of accessible pedestrian signals that come with a button that has an adjustable locator tone to help people find it, a tactile arrow that helps people feel the button and guide them to the crosswalk, an audible message that indicates when the “Walk” signal is on and what street the person is crossing. The crossing tone sounds until the flashing “Don’t Walk” signal comes on. Older signals are equipped with devices that make a clicking sound, and these can be found around the Capitol Square. Other models make chirping or buzzing sounds, such as the pedestrian signal at Sawyer Terrace and Segoe Road on Madison’s West Side. At these intersections, which can have up to four crosswalks, the different sounds are used to identify which “Walk” signal is on to avoid confusion, Schippa said. About one-fifth of the signaled intersections in Madison also have audible signals to help visually impaired pedestrians cross the streets. The head of the Wisconsin Council on the Blind and Visually Impaired believes there should be more. At the signalized intersection at Park Street and University Avenue, for example, when visually impaired people press the walk button, they hear a voice repeating “wait” until it is safe to cross. Once the walk sign is on, the voice repeats “University — walk sign is on to cross University” until the flashing and then solid “don’t walk” signal comes on. Then a repeated beeping sound signals it is not safe to cross. Jess thinks that the best audible signal is the one that tells the user what the street she is on, but one that is not drowned out by the sound of traffic. She noted that the high pitched beeping ones can be heard over traffic, but she wonders about the impact on people with hearing loss, in addition to vision loss, as sometimes lower pitch noises are more easily perceived than higher pitched ones. Jess said Madison’s image as a walkable city would be further enhanced by more audible signals. She called it “sad for a community of both Madison’s size and ethos” that it does not make it easier for the visually impaired to navigate the city. Ironically, as of the publishing of this article, there is no signal at the intersection in front of the Wisconsin Council of the Blind and Visually Impaired. Jess said the organization has been working to get one installed for nearly a year. A traffic study had to be done to ensure that the intersection needs traffic signals, which then can be equipped with audible pedestrian signals. The audible signal is slated to be installed in the summer of 2018.